The G3 Residential and Garden Steward Programs are interactive, hands-on, peer-to-peer training classes and workshops designed to motivate people from all backgrounds and gardening experience toward advocating for and making more sustainable choices in their landscapes and gardens. 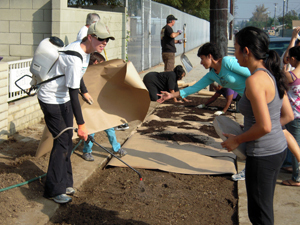 G3 offers four classes for residents and garden stewards: Hands-on Workshops (HOWs), Watershed Basics Classes, Neighborhood Walks, Conservation Coaching, and Garden Steward Series (Maintenance Practices). These classes can be customized to fit your educational program. If you would like to sponsor a class, or become involved in putting together coalitions and writing grants to fund classes in your area, please Contact G3. All G3 Homeowner and Garden Steward Programs are taught by G3 Qualified Trainers, and are custom tailored for regional and client-specific messaging. These in-garden learning events are designed to help people bridge the gap from conceptual learning in the classroom to implementation of best management practices on their own property. The difficulty of the subject matter varies with the HOW topic, but all are professionally led and designed to provide valuable hands-on experience to the least skilled residents and property stewards as well as to knowledgeable professionals. HOWs can be experienced sequentially or individually. Taken in combination, all significant topics discussed in the classroom related to assessing a site and implementing watershed wise landscaping solutions are covered by these seven workshops. 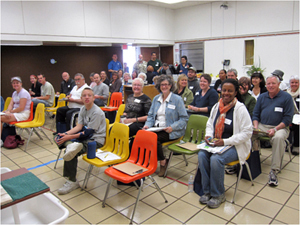 Watershed Basics Classes usually are sponsored by water providers, local city agencies or privately funded by organizations wanting to make a difference in the community. The primary objective of the Watershed Basics Class is to help participants understand their connection with the urban watershed in which they live, demonstrate strategies for reducing potable water consumption, and teach rainwater retention through the creation of beautiful, sustainable, habitat-enhancing landscapes. 3. Nurturing The "Soil Party" in Living Soil and Building a "Sponge Garden"
Who needs to wait until the next garden tour to see Watershed Wise gardens? Neighborhood Garden Walks are social, fun, organized, professionally led excursions through a regular neighborhood to better understand the elements of the local watershed that provide opportunities for improvement and those that deserve to be recognized as restorative for the watershed. 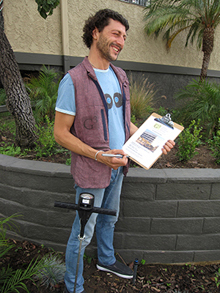 Surfrider's OFG Program utilizes Neighborhood Garden Walks (Lawn Patrol) to introduce volunteers to the principles of C.P.R. and get momentum started for the OFG Program by spotting properties that qualify for an OFG Yard Sign, or are very close to qualifying. 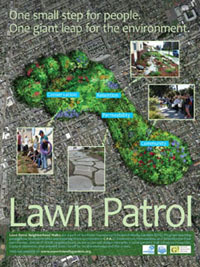 The G3 Garden Steward Series was inspired by blending Santa Barbara, CA's Green Gardener Program with various Water Management certification programs. As G3 is focused on teaching for understanding, the Garden Steward Series emphasizes hands-on, peer-to-peer training over classroom work, and is closely affiliated with the G3 HOWs. Workshops within the Series are offered in English and Spanish, and all course materials are translated into Spanish. The objective of developing the Garden Steward Series, and pairing it with the Watershed Basics Classes and HOWs, is to create a Garden Steward Qualification. G3 is working with its Program Partners to ensure that this Qualification is recognized by property owners as a value-added skill set worth paying a living wage to gain the partnership of a trained landscape steward rather than a garden janitor.